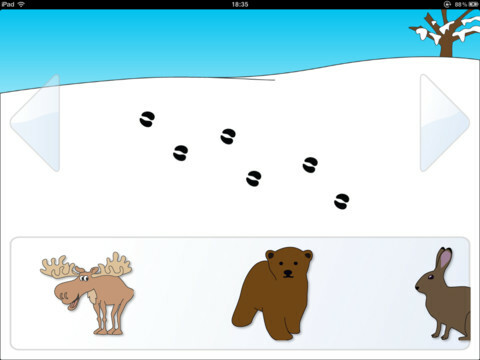 A simple educational app/game for iPad and iPhone where kids can learn the names of animals. Available in English and Swedish. A fairly big update is almost ready and will be released soon! Similar app for iPad and iPhone where you learn to recognize the droppings and tracks of different animals. Also available in English and Swedish. In the next few days we will reveal an entirely different (non-kidz) app which is currently in closed beta testing! 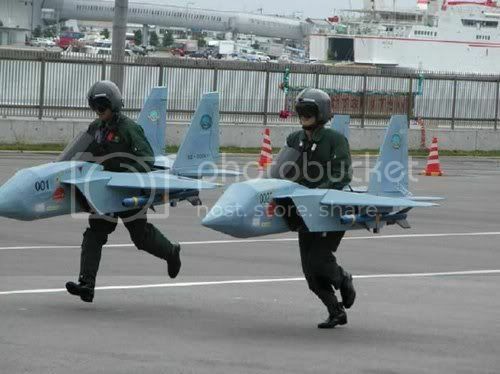 Stay tuned and support the troops. Finally! The holy grail of iOS development blawghs. A legitimate reason to rail against Apple and their draconian practices. During last week we had a problem with In-App Purchases for Warcode. Warcode is a free download on the App Store, and if you like it you can buy the full version from inside the game with the IAP API. But suddenly it had stopped working. By checking the console output from the device I could determine that it was the dreaded “Invalid product ID” error that everyone who tries to implement IAP has seen once or twice during development while trying to get everything to work (a process detailed in numerous other blog posts around the interwebs.) But I’ve never seen it in a live app on the App Store and that was a bit unsettling. From a developer perspective, one of the main awesome things about the iTunes App Store is that it’s super easy for people who want to give you money to do that, and you don’t have to deal with handling transactions, you just get paid (potentially in dollar dollar bills, y’all*). The problem is when it’s not working it’s very hard for the people who want to give you money to do that, and that’s obviously a lose-lose-lose situation (both customer, us and Apple loses). So I have a hard time understanding why the IAP system is so easy to break. Anyway on to the story. A bunch of things had happened that could somehow be related, like us just having renewed our Developer program membership and our Paid Apps contract having expired and we just resubmitted that and all sorts of stuff, so I made sure everything looked in order and everything had little green dots next to them in iTunes Connect. I also contacted Apple through some form, but I haven’t heard from them yet. So I waited and nothing seemed to happen, our sales figures were still a boring flat line. Then I remembered something about the IAP system being very particular about which status your app is in in iTunes Connect. During development I had to submit unfinished apps to be able to test the IAP and then reject them so they didn’t reach the review team, a total mess obviously and also detailed in other blog posts about IAP. Obviously Warcode was in the Ready for Sale status, as it was up on the App Store… but I had created a new version on iTunes Connect. And voila! That was indeed the problem. Amazingly In-App Purchases now works in the version of Warcode that is on the App Store again (i.e. version 1.0, the version I uploaded as 1.1 is not reviewed yet.) So the lesson learned is: if your app uses In-App Purchases, don’t create a new version in iTunes Connect until the moment you’re ready to upload the new version as you will disable all IAP in the current version of your app. It’s possible that this is documented in one of the guides you can download from Apple, but I hope this post can help someone in case there are other people like me (a bit too cool for school) out there. * We’re in Europe, so actually it’s euro euro bills y’all. Where to begin? This week has been wild. Some of you may have noticed that our first application, previously known by the code name “Project Mustang”, now known far and wide under the real name “Bang/Buck”, has been accepted by Apple and is on sale at the App Store. If you haven’t bought it yet I suggest you do it before Jonas finds out. He has just had a half bottle of Lanson champagne and doesn’t look happy. Find it here. The other app we sent in, Project Hollywood, was rejected under unclear circumstances. Anyway we fixed that today and resubmitted it so it will probably be ready pretty soon. In a Tales from the Wardrobe fashion (also known as filling our corporate blog with everyday nonsense) I’m going to tell you about the lunch we cooked today here at the office. We call it Saumon de Moutard Poire Verts d’Emma avec Bière Rangés les Pommes de Terre. Pics will be up on Flickr soon. We enjoyed it with previously mentioned Lanson and it was delicious. Anyway we’re writing this from SXSW. Just finished being on a panel about Apple’s new tablet (we know what they’re actually planning since we’re sleeping with some key people at Apple in Cupertino, so we had to keep our faces straight while discussing these stupid rumors with the other clowns in the panel, exhausting.) Last night we had some beer and watched the upcoming act Glasvegas, keep your eyes on them in 2009, will be the Next Big Thing™! In our ongoing series of Tales from the Wardrobe I feel like writing a couple more words on our recently-submitted-to-the-App Store app, Project Hollywood (not to be confused with the other Project Hollywood). Project Hollywood is laid out a little bit like an experiment — how fast could ÖeG finish an iPhone application? It started on Friday night when we were sharing a bag-in-box of wine. In this intoxicated state we finished the rudimentary interface but got stuck developing the actual underlying algorithm, as it requires logical thinking and focus. Something we were short on at 6am and drunk out of our minds. The next morning I woke up and was still a bit frustrated, so I sat down and thought it through in a more sober state. It was then very simple, but nevertheless I took it upon me to write a report about it in LaTeX. It will be available for download along with the app when it’s been approved by Apple. At first I thought I’d just write the explanation, as is the more conventional way, in the code comments, but Xcode doesn’t allow for rendering mathematical formulae in the source files (it should.) 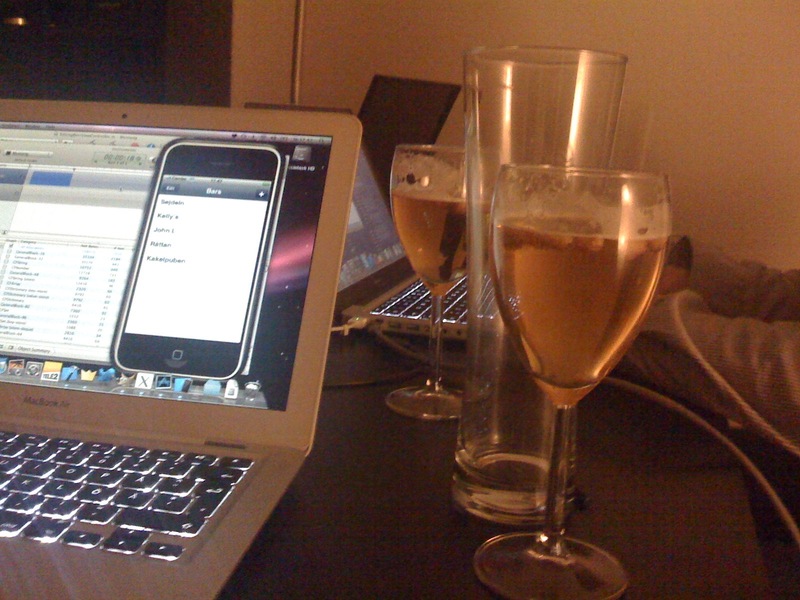 Later at the office that day we spent an hour or two adding some animation to the interface. Over the past few weeks we have seriously begun mixing our brains into the Xcode mud. As I’m sure you’ve seen in the pics posted on this blaawgh, we’ve set up office in beautiful Guldheden, Göteborg and we’re both committing a few days per week to the ÖeG cause in long, hard coding sessions. I’ve really been looking forward to soaring through the open skies with a wingman and I’m really happy with the productivity we’re sustaining into the wee hours of the morning. I’m absolutely positive this is the best way to earn a living by writing software. I’ve previously been working both in big bureaucratic organizations following rigorous procedures and done consulting and freelancing work on my own, often working from home. Poking around in someone else’s old nasty code trying to implement some whimsical ideas from the marketing department makes me feel like a midwife and running around doing short jobs for different clients makes me feel like a prostitute, selling out my beautiful code. ÖeG makes me feel like a caring father, raising our apps to be the most badass mofos in the schoolyard. If you’re following us on Twitter (and you should) you probably know that Project Mustang is almost complete and Jonas is well under way with another project that he will post about soon. We’re still waiting for our company to be registered so we can join Apple’s developer program and submit our apps to the App Store, therefore our apps will not show up there just yet. But we’ve got lots of plans for the next project, so stay tuned and you’ll be the first to know when the apps are available for download! Here are a couple of pics from last night. 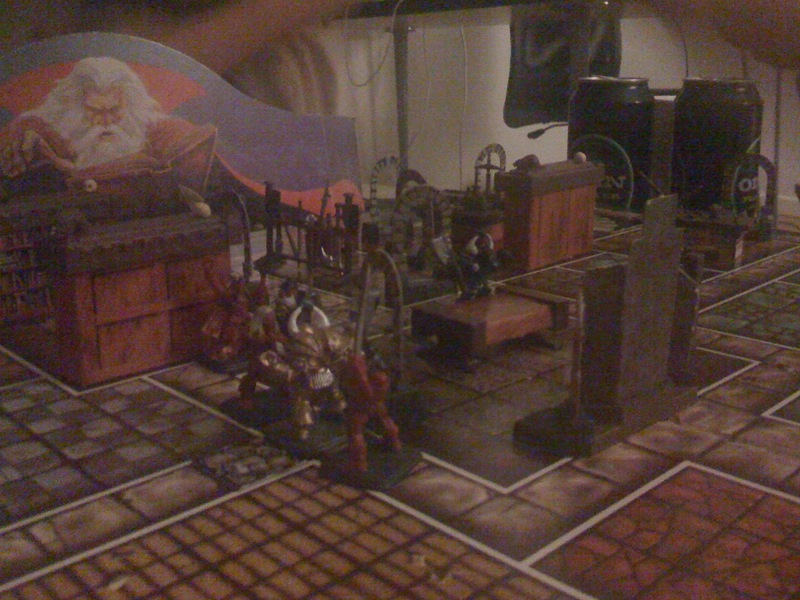 Coding session turned into a small party with some friends where we played some good old Hero Quest. I fell asleep on the couch, woke up and continued coding. Startup life ftw.